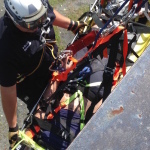 Colonie EMS works closely with it’s partners in Police and the Fire Service to provide specialized rescue services. Due to the need for EMS personnel to gain access to patients, regardless of location, the need for proper training and equipment became evident. Just as their military counterparts, civilian EMS personnel need to be properly trained and equipped to access, assess, treat, package and evacuate patients, even in hazardous environments. 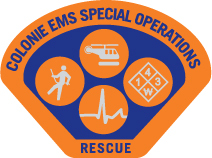 With these principles in mind, the Colonie EMS Special Operations Team was developed. Developed in April 1993 is a cooperative inter-municipal agreement between the State of New York and The Town of Colonie. Town of Colonie Paramedics fly on board State Police helicopters serving a 50 nautical mile area surrounding the Capital Region. 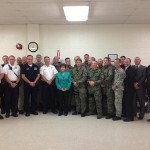 Colonie Paramedics selected for this program undergo extensive medical and aviation training. The EMS Department works very closely with our Police Department to provide medical support to our Special Services Team (SWAT). 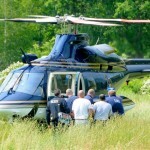 We can provide life saving care on the front lines to a police officer or victim of a criminal act. Every EMS Department member is trained in basic water rescue. This training helps prepare members to enter the water safely and treat and remove an injured person from the water. The EMS Department works closely with its partners in the fire service to provide Ice Rescue. Special Operations Units carry ice rescue suits, throw bags, and ropes to provide basic ice rescue to any person trapped or injured on the ice or in the water. 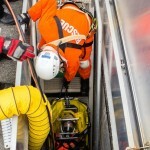 Rope rescue is needed to evacuate injured patients from high and low angles. This requires EMTs and Paramedics to be lowered to victims, to treat, package, and evacuate them with rope systems. Every member is trained in high and low angle rescue. The Town of Colonie operates a large Highway, Water, and Pure Waters Department. These Departments make several confined space entries every day. The EMS takes a lead role in providing Confined Space Rescue services for our Town Departments. Our EMTs and Paramedics participate in training for entry and support operations yearly. We also work closely with our fire service partners to provide this service to the Town. The EMS Department works closely with our partners in the fire service here in the Town as well as the Region to support the Capital Region HazMat Team. 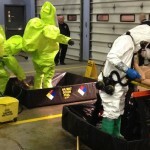 Colonie EMS provides medical support to the Team as well as the medical treatment and decontamination of victims exposed to hazardous materials. Here in the Town of Colonie we believe a successful rescue is accomplished when there is a good coordinated effort of mechanical and medical skill. We work closely with our partners in the fire service to bring medical treatment to anyone trapped in a motor vehicle.